If you have a blog or work with content, you will likely want to know which type of posts are viewed most frequently by your readers. 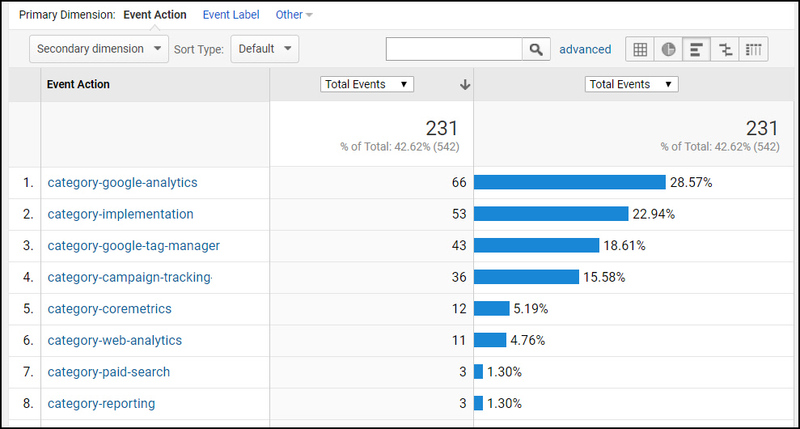 Google Analytics provides a lot of options for tracking content: it will show you what specific posts were the most viewed in the Top Pages report, allows you to group content together with the Content Grouping function, and lets you add attributes like author or post date into custom dimensions. The problem arises in the common case where you have multiple categories or tags that apply to a single post, since both Content Grouping and Custom Dimensions set just one value per category. Therefore this tutorial will show you the setup steps and scripts to produce an Event tracking report showing the most popular blog categories and tags on your site. 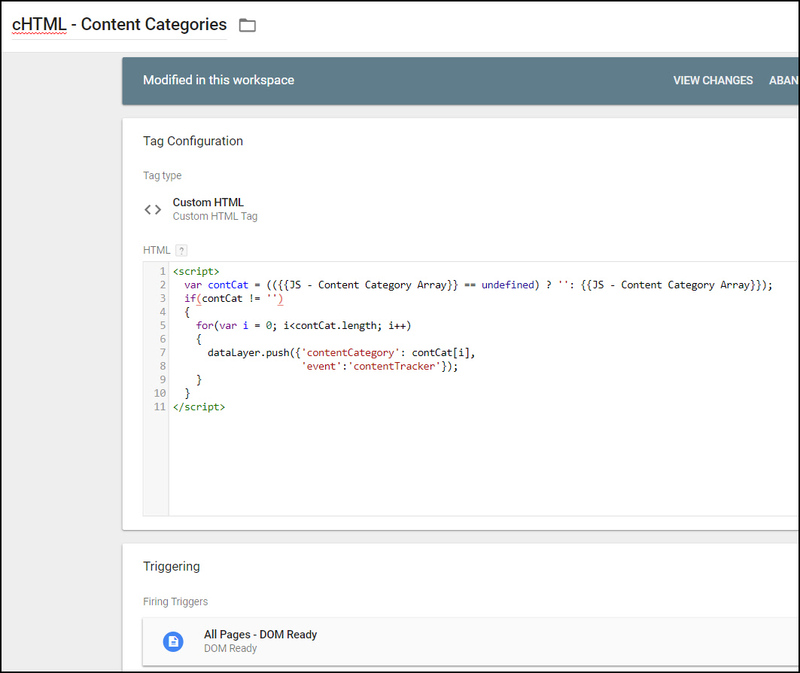 For a quicker start, in the final part of the post I’ve provided a downloadable Google Tag Manager (GTM) container that includes all the tags and scripts referenced in this post. WordPress often lists all the blog categories within an <article> tag near the top of the page. You can click Ctrl-U to view the page source and check if this is the case for your blog. The categories are all class names prefaced with the word ‘category’, while tags are all prefaced with the word ‘tag’. For this example we’ll extract the list of categories, so we write a script to loop through the list of classes and push all the ones prefaced with “category” into a new array. Extracting all the tags would be done exactly the same way, just changing the text from “category” to “tag” in the script. If it doesn’t, or you’re not using WordPress as your blogging platform, you’ll need to inspect your site and write your own code to pass the categories into a GTM Variable containing an array. Once you’ve done that, the rest of the steps are the same. Create a custom HTML tag with the following script. 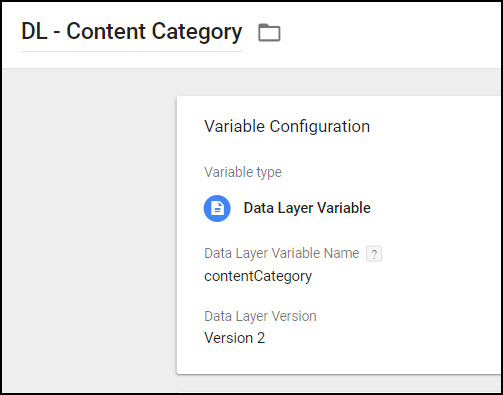 It loops through the content category array and for each element within it, pushes the value and a GTM event into the data layer. Set it to fire on All Pages – DOM Ready. 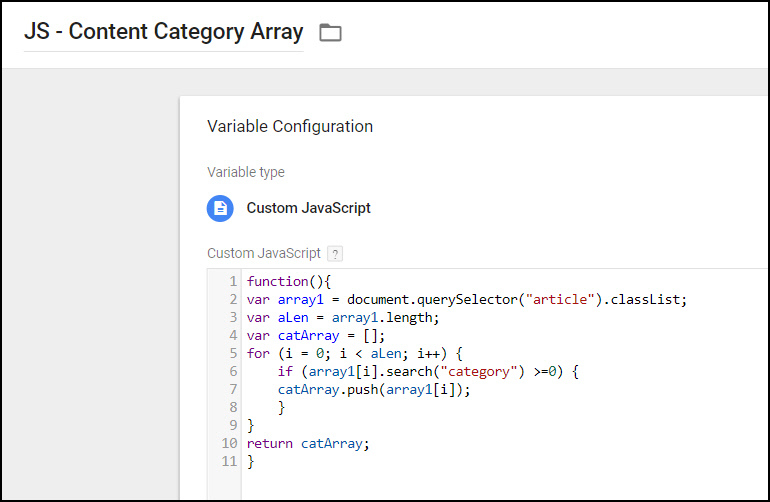 This will delay the push slightly to ensure the category values are available in time. Set up a trigger based on the ‘contentTracker’ event that gets pushed into the data layer by the custom HTML tag. 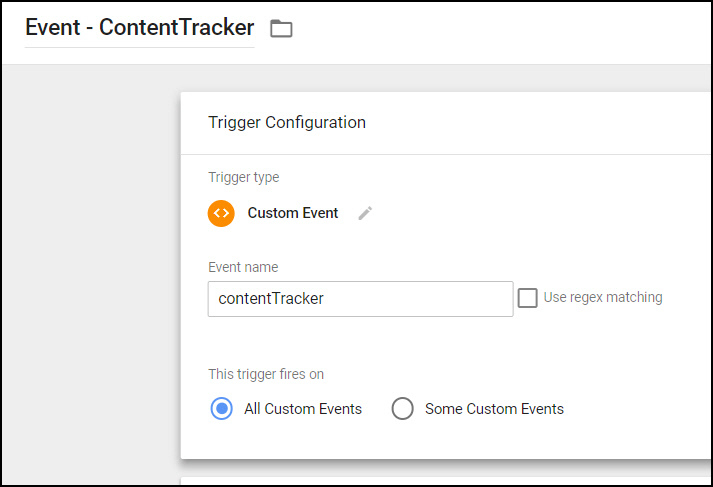 This is done at Triggers > New > Custom Event, Event name = contentTracker. 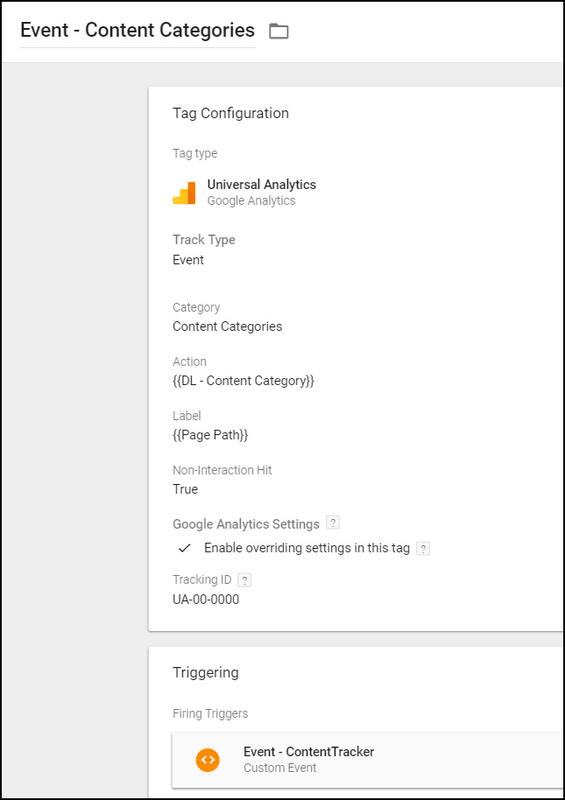 Fill in your Google Analytics tracking ID, and you’re done. After completing the above steps, you can navigate to Behavior > Events > Top Events and drill into Category = Content Categories to see a list of all your blog categories or tags, ranked in order of highest views. Once you’ve downloaded the container, in Google Tag Manager, navigate to Admin > Container and click Import Container. 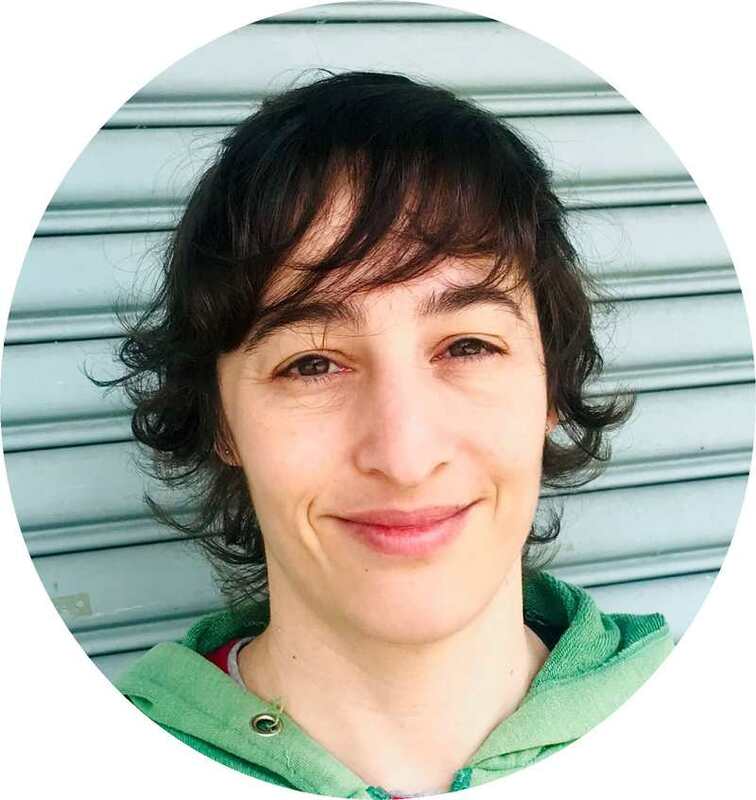 When you choose to import the container, put it into a new workspace and choose the options Merge and then Rename conflicting tags, triggers, and variables. This will ensure that nothing affects your existing GTM setup. I was just about to implement google content group when I found this article. Are there any downsides of using events instead of content groups? With content groups, you can only assign a page to a single category. With this method, you can assign a page to multiple categories. If you only need to assign a page to a single category, just use content groups — it is super easy to set up and doesn’t require any custom code. Hi Ana. Thanks for the prompt reply. For some reason, I didn’t get an email notification. Just to be clear, if I have one blog post tagged with category-paid-search and category-reporting. If it got 3 visits, it would look like your report with each category having 3 visits? Right, your report would have one line for category-paid-search showing 3 visits, and a second line for category-reporting showing 3 visits.